I know that everyone is dying for the finally announce Samsung Galaxy G3. But, Sprint did release a new update for the Samsung Epic 4G (not the Touch – the older one with a keyboard.) It is still Gingerbread, but with some fixes and enhancements. If you are rooted, the OTA (over-the-air) update will fail and possible screw-up your phone in the process. Instead, you can find the two parts of the update on the XDA forum. The Modem is now FC09 and you will need to use Odin to install it. You can download the BIN file from here and watch a video on how-to update it. Just remember that since this is a BIN you will need to put it in the Phone slot NOT the PDA slot as shown in the video. You will also need the EL30 to FC09 update. There is finally a stock version which has been deodexed and pre-rooted and you can download it from here. This version will ONLY work if you are already on EL30 which was the last official release from Sprint. Be sure to Wipe your Cache and Wipe your Dalvick Cache 3x before you install the update. Note – If you are running a custom ROM, this update will not work for you. Benefits – Sprint claims that this update eliminates the random reboots which still plagues this 2-year old phone. The GPS is also much faster. Nice that they finally got it right! This update also has the WIFI Optimizer which Sprint has promoting. The whole update process will take about 15-minutes and does NOT wipe your phone! All of you data and programs will still be there after the update process. Just want the Stock FC09 update? If you are not already rooted and want to stay that way, you can download the authentic FC09 direct from Google from here. Want a Custom Rom? There are several custom ROM for the Samsung Epic 4G available in the Developers area of the XDA forum. Just keep be sure to read through the thread for comments and problems associated with each one BEFORE you install them. Update 1/25/2015: Gingerbread EL30 Release for Samsung Epic 4G removes CarrierIQ! Samsung has heard the cries against CarrierIQ and is in the process of removing it from their Android Smartphones for the original Galaxy S line. Sprint recently released the Over-the-air (OTA) Update for the Samsung Epic 4G. However, if you have rooted your phone, the OTA update will fail. Thankfully the XDA Forum has been actively working on releasing a flashable version of EL30. The EL30 update requires that you are still on the stock BML/RFS format. If you have converted to EXT4 or MTD, you will need to convert back to apply these files or keep waiting for a developer to release a revised version. Keep checking the XDA Forum. They have already released the EI22 to EL30 modem here. EL30 is still a Gingerbread release. It removes all traces of CarrierIQ and includes a few bug fixes. Since Samsung has already announce that the original Galaxy S line will NOT be updated to Ice Cream Sandwich (ICS), this may be the last official update for the Samsung Epic 4G. Thankfully, the developers on XDA still love the phone and are continuing to release custom ROMs and kernels! Update 11/15/2011: Official Gingerbread Release for Samsung Epic 4G! Almost a year after its official release, Samsung has finally release Gingerbread for the Samsung Epic 4G. This release is available OTA only if you are on a stock ROM and did not root your phone. If you did either of these, you will not receive the Over-The-Air update for Gingerbread. You could always use Odin to return to a stock EC05 official Froyo release and remove the Root from your phone. Be sure to install the EC05 modem as well. I tried this, but was tired of waiting. I also tried using the manual update direct from Google, but this only generated errors while verifying the download when I tried to install through Clockwork Mod. This problem seems common for anyone that had previously rooted their phone. 1. Used Odin to return my Epic 4G to stock EC05. Rebooted. 2. Used Odin to return my Epic’s modem to EC05. (I was previously running a leaked version of EC06.) Rebooted. 3. Used Odin to install the official EI22 Gingerbread release. Rebooted. 4. Used Clockwork Mod to update my modem from EC05 to EI22. Rebooted. NOTE – There is now a EI22 Modem version which can be used in Odin (also available in the link from Step #3). BEFORE YOU START – Be sure to read the threads for possible problems. QBKING77 has a great series of YouTube videos for the Epic 4G covering custom Roms and various update methods to Gingerbread. Read everything. Watch the videos. Get comfortable with the process BEFORE you start. It can be scary if something goes wrong, but there are plenty of threads in the XDA Forum to help. [Original post 2/21/2011.] 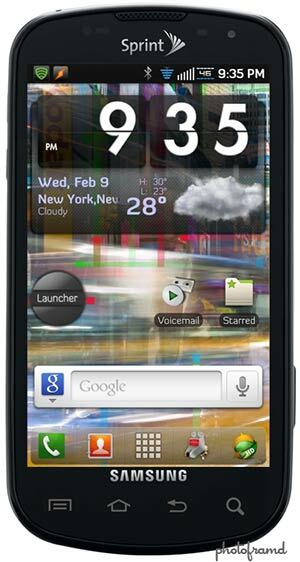 So Samsung/Sprint finally released the Froyo (Android 2.2) for the Samsung Epic 4G on February 21st, 2011 only to pull the OTA (over-the-air) update 18-hours later citing various problems. You can still manually update the Samsung Epic 4G with the official EB13 release, but there are better options available … namely Custom Roms! Custom Roms with Android 2.2. 11. Custom Viper interfaces on Home screens, notification screen, App Drawer, Phone Dialer, etc. 15. Viper Team has a dedicated site, WIKI , XDA forum and even a trouble ticket system just for the Epic 4G. It’s an impressive list. (Take a look at the YouTube video here.) And even more impressive that this home-brew group completed something that two multimillion dollar corporations (namely Samsung & Sprint) could not/would not … update the Samsung Epic 4G with Android 2.2. Downside of Rooting and Custom Roms. If the results are so great, than why doesn’t everyone just do it? The entire process involves substantially changing the state of your phone. As such, you are voiding your warranty and taking a chance on the results … namely, you can end-up “bricking” your phone. The forum.xda-developers.com has threads on restoring a damaged phone back to the factory original software and settings. However, keep in mind, that it is your phone, your actions and your responsibility. The forum does have plenty of info and the active members will try to help, but ultimately it is your decision and your risk. 1. Update your phone’s Contacts to your Gmail account. Verify that the info is on Gmail and complete! 2. Update your Calendar, Tasks and To Do List to your Gmail account. Again, verify! 3. Back-up your phone’s SD Card to your PC. Verify that your files (MP3s, videos, photos, etc.) are all backed-up on your PC. The entire rooting and flashing process will erase your phone’s internal memory. If you decide to update your files to the new EXT4 format, there is a possibility that your SD Card files can be damaged. Better to take precautions before you start. Start with Resetting Phone to Factory Default Settings. Based on threads from various blogs, you can have conflicts and problems when your existing programs are left active in your phone’s internal memory. Your best bet for a safe process is to uninstall programs like LookOut, Watchdog and other monitoring programs and then perform a hard reset on your phone. On the Home screen, go to Menu > Settings > Privacy > Factory data reset > Reset phone. This step will erase all user settings and files from the Epic 4G’s internal memory. Again, it’s very important that you backed up your data! There are several people that are real pros at the whole rooting and flashing process for the Epic 4G. The Team Viper has plenty of info on their site, WIKI and XDA forum. For additional background, there is a great walk-through on Android Central which explains the process using a different Custom Rom called Truly Epic. But, watching a video really helps. RandyShears has a great YouTube video which starts with a Samsung Epic 4G reset to factory default settings and walks through the entire rooting/flashing process with the ViperRom. This video was recorded in December 2010 and there have been interim updates to the software as noted below. NOTE: If you did apply the EB13 (Froyo Andriod 2.2) update from Sprint, you will need to follow a different set of procedures in order to Root and install a Custom ROM. Android Central has posted great step-by-step instructions in their forum. Update 11/15/2011 : ViperROM Team has disbanded! The Team Viper responsible for the ViperRom Trinity and Synergy Roms has apparently come to an end. Their website is no longer active and many of their threads on XDA have been closed. Rodderick is still active with his custom kernel for the Epic 4G. You can also find the other members in several threads. Shame them never released their Gingerbread Rom. But, there are plenty of other custom Rom developers in the XDA Forum! Have you flashed any of the EB13 ROMs yet. The video recording quality with the EB13 released by Samsung this week is horrible on my phone and I’ve heard on others as well. I’m wondering if the Viper ROMs have the same problem or if ROMing will be a viable options if Samsung doesn’t get their act together. Thanks. The camera is definitely the weakest link on the Epic. With stills, I have found it very hit or miss. But, for video, I am spoiled by the Canon 7D, so nothing is going to compare. There are several threads on the XDA Developers forum complaining about the video quality on the Epic, especially after upgrading to EB13. Several posters are talking about going back to DK28. Personally, I love the new ViperRom Trinity 2.0 4.04 with the Genocide .2a kernel (and SetCPU on conservative). The battery live is fantastic! 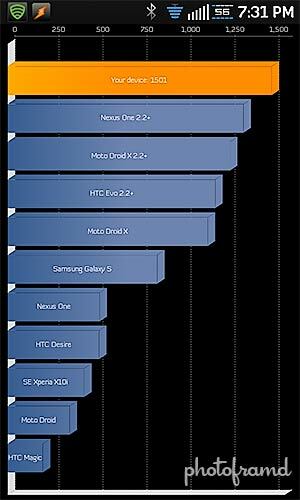 The overall performance is incredible and there is no way I would go back to a stock Samsung Rom. I have not read any posts complaining about the video quality with Trinity. And, with this group on XDA, if there was an issue, someone would complain about it. According to various posts on XDA, the video problems are related to the EB13 upgrade. Since ViperRom is built on DK28 (the preliminary “final” release for Froyo Android 2.2 on the Epic 4G), it should not have any of the issues associated with EB13. I would also recommend converting to EXT4 format. Of course, I also recommend VIPERrom [TRiNiTY v2.0] EXT4-RFS Dual DK28 4.0.4. If you converted to EXT4 or kept RFS, it will automatically pick the right version to install. Then you can reboot and install the Genocide 1.2GhzOC EB13 Kernel v0.3a. Be sure to download the SetCPU from the Market and set it for “Conservative”. You can either leave it at 120000 for a huge performance boost or scale it back to 100000 for extended battery life. There is plenty of additional info on each of these XDA links and the members are pretty helpful. READ EVERYTHING before you attempt installing anything! well. i rooted my phone and installed the bamboozle rom. i loved it for the first 5 minutes and now everything force closes. i am soooo wanting the viper rom trinity v.20 but the link that is posted gives me an error message on both my computers. i also tried to download viperstore to my phone and guess what? it force closes. i am going to need a new rom but what? help me please. Well, that’s one I have never heard of. According to this thread on XDA, the Bamboozle Rom author was banned from the Dev section … never a good sign. As for Viper Rom, Trinity 2.0 has been superseded by Synergy 2.0. We are all waiting for the next ViperRom release which will be based on the official Gingerbread release for the Epic 4G. Until then, you can try Synergy 2.0 or try one of the other Rom listed in the Dev section like UrBan Regeneration or ACS Swiss Cheese Samsprint EE03. There are plenty to choose from. Just read the ROM’s thread carefully and take note of the required modem for that Rom. There is plenty of info in the Dev section including how to go back to the stock Rom (even from a bricked phone). Hope this helps. I am running Frankenstein ECO50CE v3 w/ Genocide Kernel EB13 1.2GHz Overclocked. At first Wifi didnt work til I download “FXR Wifi fix and rescue” from Andriod Market and it was the solution to fix the WIFI auto turn-off. So far, it is a great ROM, I had no other issues with it. It is super fast, never freeze on me. Video quality looks good, taking photo with HDR app looks good. Angry Bird always work. It is also ROOTED. Good to know. I think the latest leaked release of Gingerbread is EG22. The final version should be out soon. Team Viper announced that the next ViperROM (which will be based on the final release version of Gingerbread) will be their last one for the Samsung Epic 4G. They have all moved on to other projects (both personal and otherwise). Shame, but there are other teams still pumping out Custom Roms for the Epic.